Once upon a time, long, long ago, my parents took me to the Rex Cinema for a birthday treat. It was a double bill of Reach for the Sky, the wartime story of RAF fighter pilot Douglas Bader, and The Cockleshell Heroes. Having been brought up on feats of derring-do, it felt like being a kid in a sweet factory; or possibly a small boy in a cinema watching two war movies. Youth doesn’t have the same kind of imagination that age gives us. 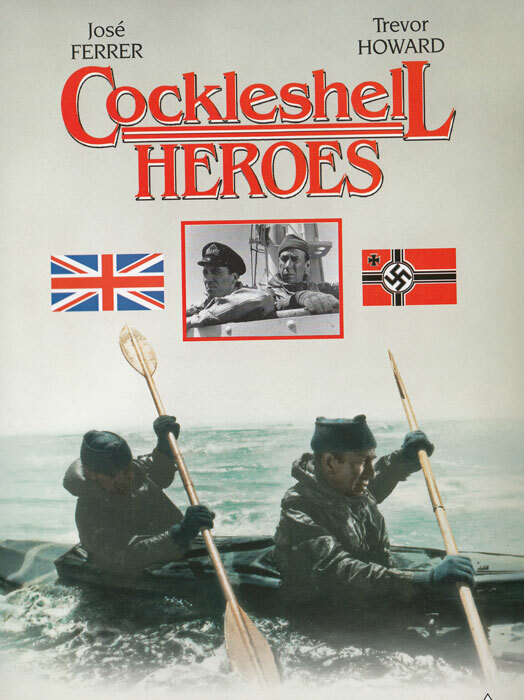 The Cockleshell Heroes, a fictional account of a real commando raid on France in 1942, held a particular interest, because the heroes were Royal Marines and trained in Portsmouth. 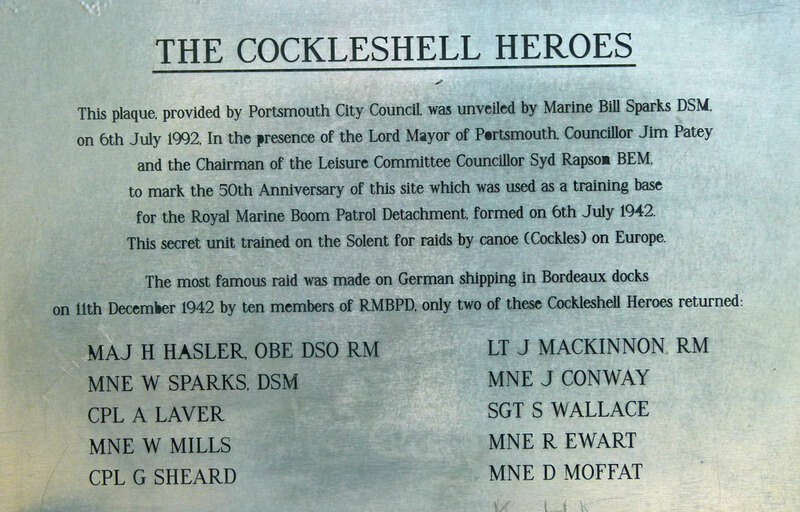 I knew Portsmouth, recognised several places in the film – and my grandfather had been a Royal Marine, based there. Just near the Canoe Lake and esplanade in Portsmouth’s Victorian seaside suburb of Southsea, are the remains of Lumps Fort. 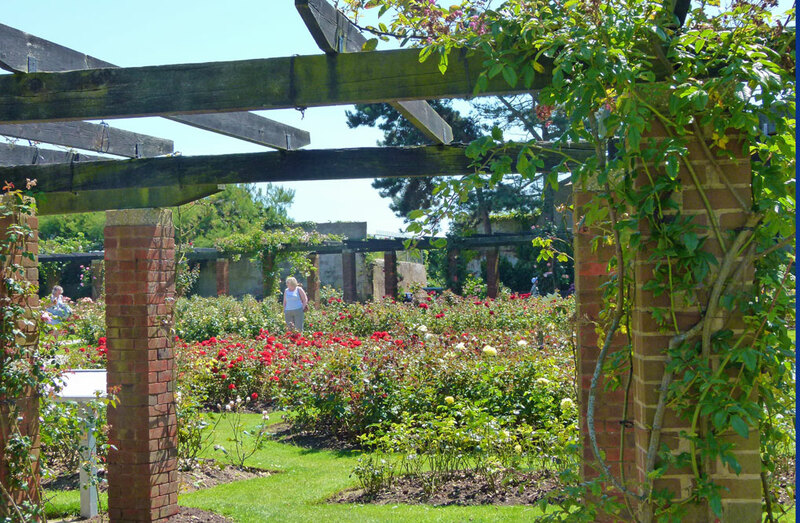 Few people know it as that these days – it is now the Rose Garden and has been for decades. This walled oasis of tranquillity, with its formal paved walkways, holds more rose bushes than you can shake a stick at, with in excess of 40 varieties. When in bloom, it is stunning. Pergolas offer shade round the edges and there are seating areas in what look like old gun emplacements. But in the dark days of 1942 it was where the Royal Marine Boom Patrol – forerunner of the Special Boat Service (SBS) – trained. These volunteers, so incredibly young, carried out what was really a suicidal mission to dislocate German military and other supplies by destroying ships in the occupied French port of Bordeaux. The plan, brainchild of Major Herbert ‘Blondie’ Hasler, was to paddle 6 two-man collapsible canvas kayaks, known as ‘cockles’ 70 miles up the Gironde river and fix magnetic mines – ‘limpets’ to the sides of likely-looking ships. The mission, codenamed Operation Franklin set sail on the submarine HMS Tuna from Holy Loch on 30th November 1942. On 7th December, 5 cockles were launched from Tuna, one having been damaged in action en route. The ten young men set off across the open sea toward the Gironde, battling through the tidal races in the estuary – which resulted in the loss of two craft. 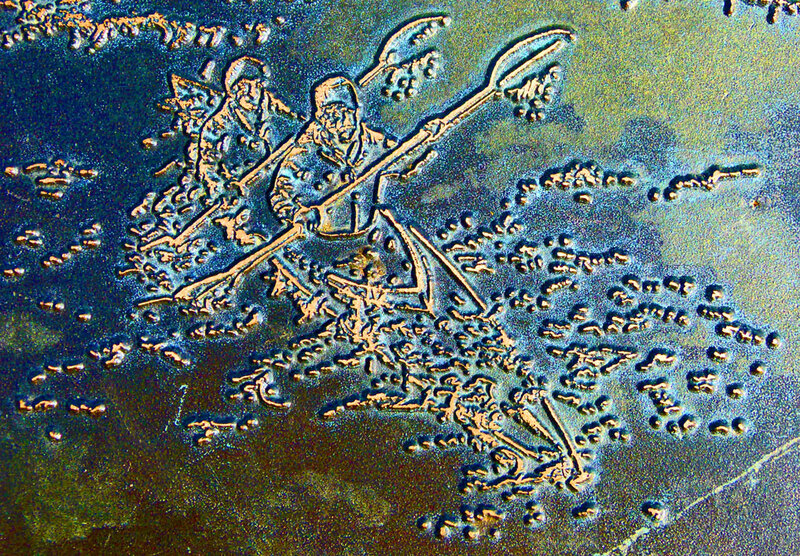 Paddling by night and laying up by day, two cockles reached Bordeaux and laid their mines. One ship was sunk, four were damaged and the harbour facilities were disrupted for some considerable time. Two of the commandos survived – Hasler and his partner Bill Sparks: two died of hypothermia from capsizing in the tidal races; six were captured by the Germans and executed. The ultimate achievements of the raid are unclear, though Churchill is reputed to have claimed that it shortened the war by six months. Surely, he was being kind. The film, made in 1955, stars Jose Ferrer, Trevor Howard and Anthony Newley. It is fairly predictable stuff in many ways, though not without its moments; Newley is particularly awful. The reality is that Franklin was an ill-conceived scheme, almost casually planned and based on inadequate intelligence. The highly dangerous conditions in the Gironde estuary seem to have come as a surprise. The lack of inter-service liaison and cooperation is just as damning. SOE (Special Operations Executive) planned to attack the same target, and at the same time, but neither party had an inkling of the other’s plans. The SOE raid was called off by its leader only when he heard the explosions in the harbour. Nor was there any plan for the raiders to escape after planting their limpets – Hasler and Sparks got lucky and made it to Gibraltar with the help of French Resistance. Those that approved Franklin condemned its brave participants to almost certain death. I remember their untroubled faces staring up at me from photographs in a book I read once. This plaque, provided by Portsmouth City Council, was unveiled by Marine Bill Sparks DSM on 6th July 1992, in the presence of the Lord Mayor of Portsmouth, Councillor Jim Patey and the Chairman of the Leisure Committee Councillor Syd Rapson BEM, to mark the 50th Anniversary of this site which was used as a training base for the Royal Marine Boom Patrol Detachment, formed on 6th July 1942. This secret unit trained on the Solent for raids by canoe (Cockles) on Europe. There are further plaques on the houses where the officers and men lived whilst training for the raid, at 9 Spencer Road and 27 Worthing Road. The latter was a guest house known as White Heather, probably after the daughter of the house, Heather Powell. She and Marine Robert Ewart fell in love; Bobby, from Glasgow, never made it back to her and she herself died shortly afterwards – it is said of a broken heart. 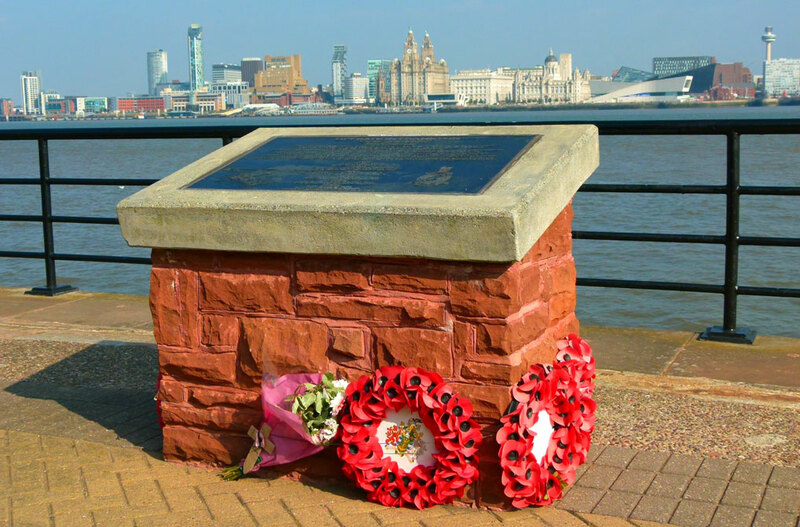 A further memorial was unveiled in Birkenhead, home of Corporal Albert Frederick ‘Bert’ Laver, in December 2012, by Lord ‘Paddy’ Ashdown – himself an ex-marine and author of a book on the raid – A Brilliant Little Operation. Corporal Laver was aged just 22 when he signed up for the top secret mission. He visited a cousin at home before leaving. They went to the pictures and he told her he thought he might not be coming back. 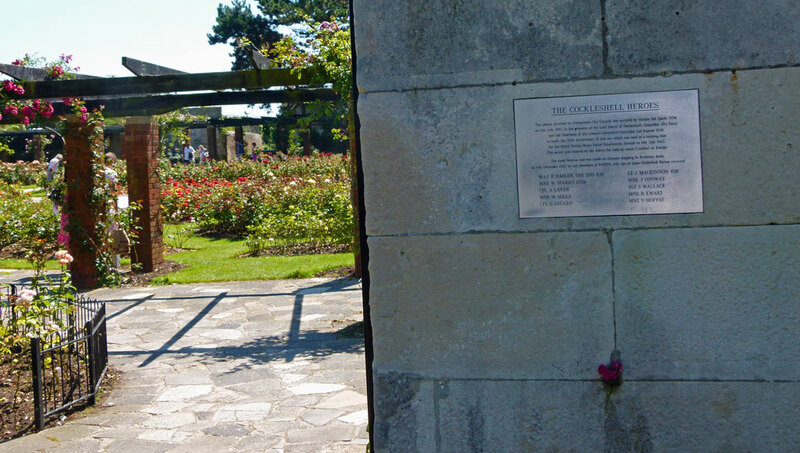 Go to A Bit About Britain’s directory listing for Southsea’s Rose Garden. Beautiful garden! Great post and blog! Great post – there are some interesting stories from the war – have you ever seen this one? I haven’t seen the film but I have read the book. As always, very interesting read. I remember going to see that as well, stering stuff then. I saw the film on TV a couple of years ago. The film isn’t brilliant but it made me aware of the mission and the futility of it. Thank-you for this interesting post – I am glad I discovered your blog. I’m glad you discovered my blog too – thanks for dropping by! I’d never heard this story before. I love that the old training facility has been planted with flowers and commemorates the bravery of the young men who carried out the mission. It’s sad they were so young, and almost surely sent out on a mission they couldn’t be expected to survive. Love the roses. I wish mine looked that good. As William stated above, I also didn’t know this part of history but I tend to not watch movies with Jose Ferrer in them (not a fan). The place looks quite peaceful, all told. This is one element of the history of that war I was unfamiliar with.